Choose Size: 18"x24" 12"x18" 9"x24" 24"x18" 18"x12" 24"x24" 24"x36" 36"x24"
By "Choosing Number of Colors", you are selecting how many print colors you want on your sign. 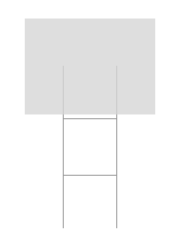 This does not include the background color choice of either White or Yellow. This is only for the print colors. Example, if you have a sign that is white background with Fire Red and Reflex Blue print colors, your design would be a 2 color print. 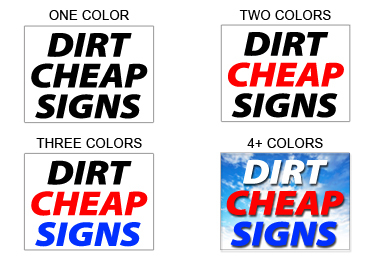 By ordering single sided signs, your design will only be printed on one side of the sign. This is a good option for Yard Signs or Bandit Signs that are used with Wooden Stakes or attached to poles, fences or trees. Selecting double sided signs ensures that your design will be seen on both sides of the sign. This is perfect for the Signs that are being placed in frames or using H Stakes to place into the ground along the roadside. Traffic will see your message from both directions. 30" H Stakes are wire stakes that are 10" wide by 30" tall. They are an economical solution to place your Yard Signs into the ground. You simply insert the H Stake into the Flutes that run vertical through the sign, then insert the stake into the ground and gently step on the cross bar to secure the stake. 15" H Stakes are wire stakes that are 10" wide by 15" tall. They are an economical solution to place your Yard Signs into the ground. You simply insert the H Stake into the Flutes that run vertical through the sign, then insert the stake into the ground and gently step on the cross bar to secure the stake. Grommets are metal rings that are placed on your sign to make it easy to hang. We place the grommets in all four corners and recommend that you not place any images or graphics in this area while designing your sign. If you need your grommets in a certain spot (ie. 16" on Center) for hanging from Real Estate posts, please indicate so when checking out. If you forget, please call us immediately and we will place accordingly. To retrieve shipping options choose quantity, enter your ZIP Code and click on Calculate button please.